The Mount Pleasant Radio Observatory is a radio astronomy based observatory owned and operated by University of Tasmania, located 20 km east of Hobart in Cambridge, Tasmania. It is home to three radio astronomy antennas and the Grote Reber Museum. The large number of available receivers makes the telescope suitable for a variety of research projects within the University of Tasmania and its location makes it a vital element in the Australian Long Baseline Array network. The observatory has two active radio telescopes: the Mount Pleasant 26 m antenna and a 12 m AuScope VLBI Antenna. The Observatory is linked to the University of Tasmania's Hobart campus with a 25 km fibre optic cable, installed in 2007. The 14 m Vela telescope that was constructed in 1981 as a dedicated instrument for observation of the Vela Pulsar has been decommissioned since 2006 and is in the process of being refurbished. The telescope used to track the pulsar 18 hours a day, nearly continuously for over 20 years. The 26 m Radio dish came from the Orroral Valley Tracking Station, ACT, where it was used as a satellite tracker within the Spacecraft Tracking and Data Acquisition Network and then for support to NASA manned missions. 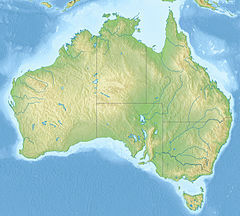 The 26 m telescope is used in Australia's very long baseline interferometry (VLBI) network. The University of Tasmania also operates three other radio astronomy antennas: the 30 m Ceduna Radio Observatory (SA) and two additional AuScope 12 m antennas at Katherine (NT) and Yaragadee (WA). The University also owns and operates the Bisdee Tier Optical Astronomy Observatory. The Canopus Hill Observatory is closed. There is also a museum on site dedicated to the life and works of Grote Reber. It contains some of his ashes and a state of the art 3D theatre. It also discusses the major role Tasmania plays in radiophysics The museum hosts about 5000 visitors annually and runs several Open Days each year. University of Tasmania students also act as tour guides as part of their studies. Wikimedia Commons has media related to Mount Pleasant Radio Observatory. ^ a b c Johnston-Hollitt, Melanie (August 2004). "Mt Pleasant Observatory". School of Mathematics & Physics, University of Tasmania. Archived from the original on 2005-06-16. Retrieved 2009-04-28. ^ Reid, Brett; John M. Dickey (2006). "Hobart, Mt. Pleasant, Station Report for 2006". University of Tasmania, Geoscience Australia. Retrieved 2009-04-28. ^ "Big technical advance for Tasmania's radio telescope" (2:40 pm AEST). ABC News. Apr 27, 2007. Retrieved 2009-04-28. ^ Dodson, Richard; Dion Lewis; Peter McCulloch (20 March 2007). "Two decades of pulsar timing of Vela". Astrophysics and Space Science. Netherlands: Springer Netherlands. 308 (1–4): 585–589. arXiv:astro-ph/0612371. Bibcode:2007Ap&SS.308..585D. doi:10.1007/s10509-007-9372-4. ISSN 0004-640X. Retrieved 2009-04-28. ^ Mackellar, Colin. "A STADAN antenna: Satellite Tracking and Data Acquisition Network". Retrieved 2009-08-12.